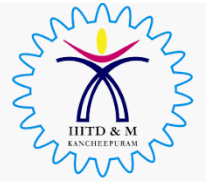 Center for High Performance Reconfigurable Computing, Indian Institute of Information Technology Design and Manufacturing (IIITDM) Kancheepuram is organizing a five-day Workshop on Artificial Intelligence for All during June 17-21. This workshop aims to introduce and provides a learned experience of a broad range of the techniques used in Artificial Intelligence and Machine learning. Starting with the basics, the workshop progresses to the latest techniques and intriguing research areas of present-day Artificial Intelligence technological landscape. The workshop aims to provide a solid foundation in theory as well as practical knowledge to approach a real-world problem involving machine learning and Artificial Intelligence. Introduction to Machine Learning, Classification of Machine learning Problems, Probability Theory, and optimization. Linear Regression, Regularization (Ridge and Lasso) and Hands on. Classification Problems, Perception, Logistics Regression, More Classification, Kernal Methods/ SVM, Decision trees and Hand on. Introduction to Deep Learning: neural networks, representation, backpropagation. Hands-on deep learning framework, hands-on First Neural net (pytorch). Deep learning: Computer Vision, Convolution neural nets, different architectures, transfer learning, and hands-on CNN. Introduction to NLP: recurrent nets, LSTM/GRU, Word Embeddings, Introduction to latest architectures and hands-on RNN. Faculty/Scientists/Researchers/PG and UG Students working on artificial intelligence models. Participants should have a working knowledge of data structures, algorithms, and probability theory. Basic understanding of hardware architectures. Free Internship opportunity at HPRC will be given for the interested UG and PG student participants. R&D Labs/ Faculty/ PSUs With Hostel Accommodation: Rs. 8000. R&D Labs/ Faculty/ PSUs Without Accommodation: Rs. 6000. Research Scholars, PG & UG Students with Accommodation: Rs. 7000. The registration fee covers food and hostel accommodation for all the 5 days. No TA/DA will be provided. Registration Closes by June 08, 2019.